The Class A motorhome, also commonly referred to as the conventional motorhome, is the largest, most luxurious of the motorized RVs. 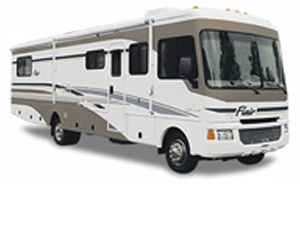 This motorhome is a virtual “home away from home” on wheels that is fully loaded and equipped for short trips, lengthy vacations or even full-timing. The Class A is entirely constructed on a bare, specially designed motor vehicle chassis. Average length: 21 to 40 feet. 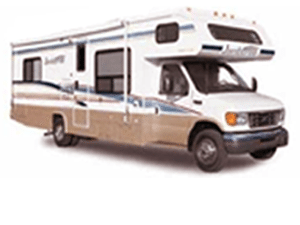 The Class C motorhome, sometimes referred to as a mini-motorhome, provides the conveniences of a larger motorhome in a scaled-down version and at a lower price. The Class C is built on an automotive manufactured van frame with an attached cab section. Can sleep 4 to 8 people and very in Size: 20 to 32 feet. Designed to be affixed and towed by a pickup equipped with special hitch in the truck bed, these two-level units can provide the greatest living of all towable RVs. Fifth-wheel travel trailers come equipped with all the comforts of home, and are perfectly adaptable for weekend getaways, family vacations and full-timing. Bumper tow trailers provide for easy towing with as small as a quarter ton truck for lite hybrid travel trailers. Toyhauler are also in the towable RV type. 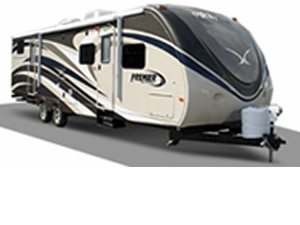 Toyhaulers come in 5th wheel as well as bumper tow and have large cargo areas. Usually equipped with generators for dry camping.